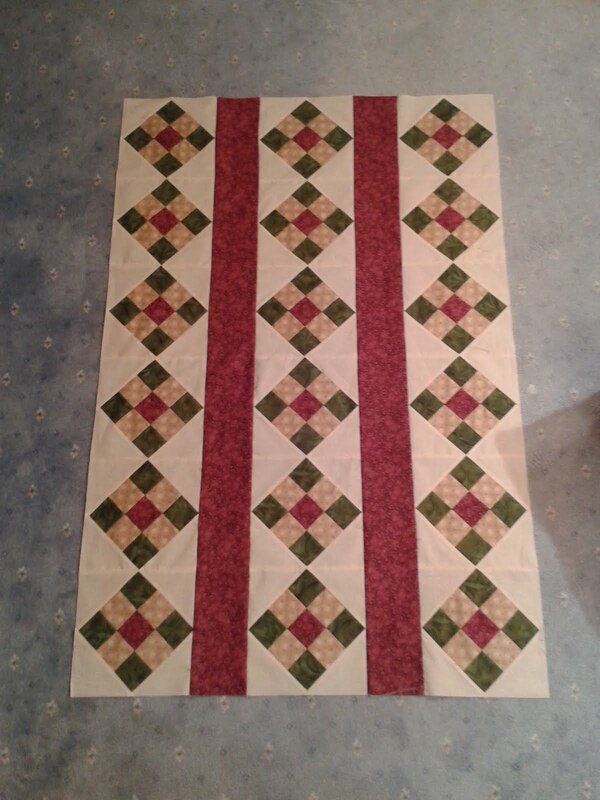 I've put the centre sashing strips in Mum's Quilt this evening - and I'm delighted with how the red fabric brings the strips of nine patch blocks out. 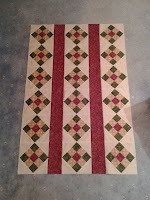 I'm also very pleased that when I measured the block strips to cut the sashing, I was only ⅛" inch short of what the measurement should be in theory if you were really accurate with your seam work - i.e. the strip should have been 51 ½" and mine was 51 ⅜". I have a tendency to over-egg my seam allowances a little so my blocks come out slightly small (these were pretty much ⅛" short over each 9" unfinished block) - something which I must work harder at - so I sewed very scant seems whilst putting the blocks together and this has paid off. Doesn't that red just make the blocks look wonderful? It's going to be a gorgeous quilt. Wow, you're really steaming along with this quilt, it's looking gorgeous. The red makes it sing. just keeps looking nicer and nicer! The red works really good. Great job so far. I'd so glad it's working out for you!